Terahertz (THz) electromagnetic radiation covers an important frequency range between high-speed electronics (1 GHz) and below far-infrared optical radiation (>100 THz) [1,2]. This region of the electromagnetic spectrum has important technical applications ranging from vibrational states of molecules, to biomedical imaging and security applications, to low energy excitations in correlated quantum materials. However, within the THz regime, from ~0.1 THz to 30 THz, exists a gap in which there are no efficient, reliable semiconductor technologies to serve as sources and detectors (the so-called, “terahertz gap”). Much effort has been directed toward the development of easy-to-use THz sources and detectors with high signal-to-noise (SNR) ratios, broad bandwidths, and large peak electric fields. In our group, we have developed novel device structures that can serve as next-generation THz sources and detectors. We first reported on the generation of ultrabroadband, high electric field THz pulses from interdigitated photoconductive antennas fabricated on cost-effective semiconductor substrates. We demonstrated that enhanced THz emission can be achieved from photoconductive antennas when the semiconducting substrate material properties are changed through femtosecond laser ablation. 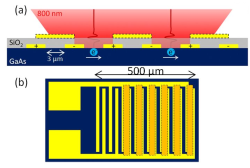 More recently, by employing the strong light-matter interaction of patch antenna microcavity arrays, we demonstrated that THz emission from quantum cascade structures can be enhanced by up to 44-fold. Current work continues in the development of novel broadband, high amplitude, and high repetition rate THz sources, and their use for spectroscopy in extreme environments, such as large magnetic fields. Below we list the recent publications within this avenue of research. J. Infrared Milli. Terahz. Waves (2017). doi:10.1007/s10762-017-0418-6. We perform a comprehensive study on the emission from finite arrays of patch antenna microcavities designed for the terahertz range by using a finite element method. The emission properties including quality factors, far-field pattern, and photon extraction efficiency are investigated for etched and non-etched structures as a function of the number of resonators, the dielectric layer thickness, and period of the array. In addition, the simulations are achieved for lossy and perfect metals and dielectric layers, allowing to extract the radiative and non-radiative contributions to the total quality factors of the arrays. Our study shows that this structure can be optimized to obtain low beam divergence (FWHM <10°) and photon extraction efficiencies >50% while keeping a strongly localized mode. These results show that the use of these microcavities would lead to efficient terahertz emitters with a low divergence vertical emission and engineered losses. Far-field emission patter for patch antenna array with varying number of resonators (N). Appl. Phys. Lett. 109, 141103 (2016). We study the emission properties of an electroluminescent THz frequency quantum cascade structure embedded in an array of patch antenna double-metal microcavities. We show that high photon extraction efficiencies can be obtained by adjusting the active region thickness and array periodicity as well as high Purcell factors (up to 65), leading to an enhanced overall emitted power. Up to a 44-fold increase in power is experimentally observed in comparison with a reference device processed in conventional mesa geometry. Estimation of the Purcell factors using electromagnetic simulations and the theoretical extraction efficiency are in agreement with the observed power enhancement and show that, in these microcavities, the overall enhancement solely depends on the square of the total quality factor. 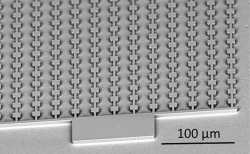 SEM image of a fabricated patch antenna microcavity array. Opt. Lett. 40 (14), 3388-3391 (2015). We report on the first terahertz (THz) emitter based on femtosecond-laser-ablated gallium arsenide (GaAs), demonstrating a 65% enhancement in THz emission at high optical power compared to the nonablated device. Counterintuitively, the ablated device shows significantly lower photocurrent and carrier mobility. We understand this behavior in terms of n-doping, shorter carrier lifetime, and enhanced photoabsorption arising from the ablation process. Our results show that laser ablation allows for efficient and cost-effective optoelectronic THz devices via the manipulation of fundamental properties of materials. 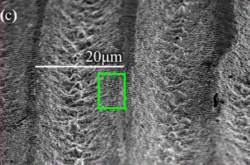 SEM image of the femtosecond-laser-ablated photoconductive antenna. Opt. Express 22 (21), 26358-26364 (2014). We demonstrate broadband (20 THz), high electric field, terahertz generation using large area interdigitated antennas fabricated on semi-insulating GaAs. The bandwidth is characterized as a function of incident pulse duration (15-35 fs) and pump energy (2-30 nJ). Broadband spectroscopy of PTFE is shown. Numerical Drude-Lorentz simulations of the generated THz pulses are performed as a function of the excitation pulse duration, showing good agreement with the experimental data. Side view (a) and top view (b) schematic of our interdigitated photoconductive antenna structure. R. Kohler, et al. Terahertz semiconductor-heterostructure laser, Nature, 417, 156-159 (2002). M. Tonouchi, Cutting-edge terahertz technology, Nature Photonics, 1, 97-105 (2007). B. Clough, J. Dai, and X. C. Zhang, Laser air photonics: beyond the terahertz gap, Mater. Today 15 (1-2), 50-58 (2012).